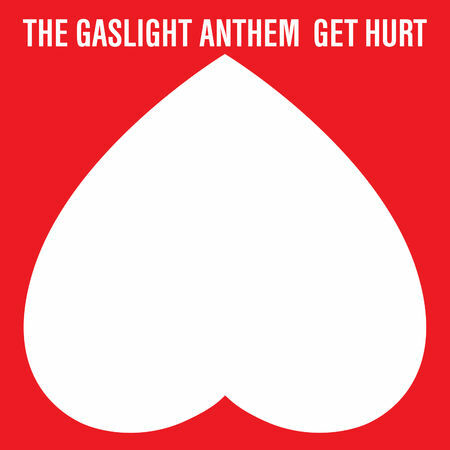 The Gaslight Anthem – Get Hurt – CRITICULT – Telling you what to think since 2003. If you put a gun to my head and asked me to name my favorite band right now it would be The Gaslight Anthem. I want to say that from the outset so you understand my bias and why I still think Get Hurt is the best rock album to come out this year. From the very start of Get Hurt the veteran fan will know they are in strange territory with The Gaslight Anthem. Kicking off with an isolated drum before tearing in to a Black Sabbath inspired riff the first song, “Get Vicious”, immediately announces this is a different album than what came before. While not abandoning the Bruce Springsteen style blue collar rock that defined them this album does dispel the idea once and for all that The Gaslight Anthem is a Springsteen tribute act. The AM radio vibe that The Gaslight Anthem has always lived under is still omnipresent but there is a vibe of darkness that was never as prevalent before. There aren’t just singles here, Get Hurt is an honest to God ALBUM at time when that term is anathema to the music industry. In terms of modern rock Get Hurt IS the “weird album”. It takes more that one listen to really grab on to it and even more than that to realize that the whole thing – and I’m including the bonus tracks pushing the album to 15 songs – is damn near without peer. Especially at a time when nu-rock bands are a dime a dozen on modern rock radio The Gaslight Anthem is a rock outfit unlike any other. With Get Hurt the guys show they can flip just as easily between distortion based guitar rock as they can to lyric driven soul searing blues rock. This is the best rock album of the year. Not to mince words, there are few other bands that can touch The Gaslight Anthem in terms of consistent and important song writing. Frank Turner, Against Me!, Butch Walker, and Jack White are the only popular acts that are playing the kind of music that doesn’t require a soundboard Pro Tools to make palatable. Get Hurt, “weird” or not, is unparallelled against their contemporaries. “Get Vicious”, “Ain’t That a Shame”, “Selective Poems”, “Dark Places”, and “Sweet Morphine” are all terrific songs – but even more important – they are saying something. Against the earlier albums Get Hurt holds it’s own and may be their best album yet. I consider Handwritten, American Slang, and The ’59 Sound, among the best rock albums in the last several years so understand I don’t praise Get Hurt lightly. In fact, I really didn’t like it all that much when I heard it the first time. The fact is this album is different from their other stuff but that is what makes it good. It does take some time to get in to it but honestly its refreshing because so few releases these days require and reward that kind of commitment. The Gaslight Anthem have always written songs that feel like they need to be listened to at night. It’s in their name after all. This is music that works best in darkness, preferably with a strong beer or bourbon. With Get Hurt, the guys tap in to the darkness while still maintaining their romanticism yet never feeling cliched or rote. Run, don’t walk, to get this one immediately. Even better, make sure to catch the band when they come to your town. Speaking from experience they are one of the best live acts out there. Pingback: The Best Albums of 2018 (Part 2) – CRITICULT – Telling you what to think since 2003.